Also serving communities of Stevens, Denver, New Holland. There are 32 Assisted Living Facilities in the Ephrata area, with 4 in Ephrata and 28 nearby. The average cost of assisted living in Ephrata is $4,137 per month. This is higher than the national median of $3,346. Cheaper nearby regions include Lititz with an average starting cost of $3,405. To help you with your search, browse the 66 reviews below for assisted living facilities in Ephrata. On average, consumers rate assisted living in Ephrata 4.2 out of 5 stars. Better rated regions include Lititz with an average rating of 4.3 out of 5 stars. Caring.com has helped thousands of families find high-quality senior care. To speak with one of our Family Advisors about assisted living options and costs in Ephrata, call (855) 863-8283. Promotion ends in 58 days! SPRING SPECIAL! $300 off rent for selected rooms & Community Fee discount for Veterans!!! Ephrata is a borough of about 14,000 people in Lancaster County, 38 miles southeast of Harrisburg. Its population grew rapidly from 1970 to 2000, although it has remained stable since then. The city's senior population is currently at 13.8 percent. Ephrata seniors will find 32 assisted living facilities in the Ephrata area, with four in the borough itself and the other 28 in nearby areas such as Lancaster and Lititz. Title 55, Chapter 2800 of the Pennsylvania State Code regulates assisted living residences in the state. In addition to providing a residence, these living facilities also provide seniors with assistance in daily living activities. Ephrata has mostly flat land with a moderate climate and steady rainfall throughout the year, making it suitable for farming. February has the most snow, with an average of 7.5 inches, although all months from November to April typically receive some snow. Seniors in Ephrata should be able to engage in outdoor activities throughout the majority of year. Ephrata’s overall cost of living is about three percent higher than the national average. Utilities and groceries are the biggest contributors to the higher cost of living, at 23 percent and 11.5 percent of the national average respectively. Seniors living in Ephrata will need to budget their expenses more carefully than they would in many other U.S. locations. The overall crime rate in Ephrata is lower than the average across the U.S. The crime rate in Ephrata is significantly lower than the rate for the entire state. This borough is therefore one of the safer areas for seniors in Pennsylvania. Red Rose Transit provides public transportation for Lancaster, with Route 11 serving Ephrata. Seniors ride for free at all times with the Senior Free Ride Program sponsored by the state lottery. Disabled passengers pay half fare during non-peak hours. The Ephrata Senior Center maintains a regular schedule for seniors which includes games, clubs, adult education and exercise. It also sponsors special events, including out-of-town trips. This senior center serves hot, buffet-style meals six days a week. The Ephrata area is home to world-class medical facilities, including Ephrata Community Hospital and Lancaster General Health Urgent Care, in the event of medical emergencies or illness. Assisted Living costs in Ephrata start around $4,137 per month on average, while the nationwide average cost of assisted living is $4,000 per month, according to the latest figures from Genworth’s Cost of Care Survey. It’s important to note that assisted living rates in Ephrata and the surrounding suburbs can vary widely based on factors such as location, the level of care needed, apartment size and the types of amenities offered at each community. 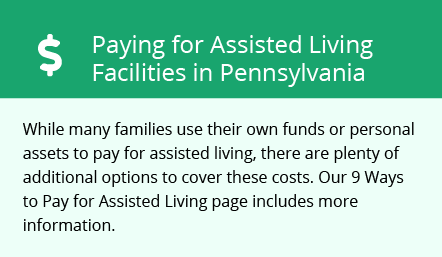 Pennsylvania does not have any waivers to offset assisted living costs at this time, but the state does offer a supplement to SSI for residents in non-nursing residential care. Ephrata and the surrounding area are home to numerous government agencies and non-profit organizations offering help for seniors searching for or currently residing in an assisted living community. These organizations can also provide assistance in a number of other eldercare services such as geriatric care management, elder law advice, estate planning, finding home care and health and wellness programs. To see a list of free assisted living resources in Ephrata, please visit our Assisted Living in Pennsylvania page. Ephrata-area assisted living communities must adhere to the comprehensive set of state laws and regulations that all assisted living communities in Pennsylvania are required to follow. Visit our Assisted Living in Pennsylvania page for more information about these laws.